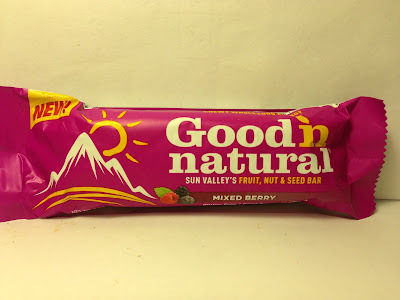 I mostly thought I was done reviewing Good 'n Natural products, but on a recent trip to Kroger, I noticed that they have a new(ish) flavor that has popped up and that leads me to this review of their Good 'n Natural Mixed Berry Bar. Being the bargain shopper that I am, I waited a week or two until this was on sale and then grabbed it for $0.99. 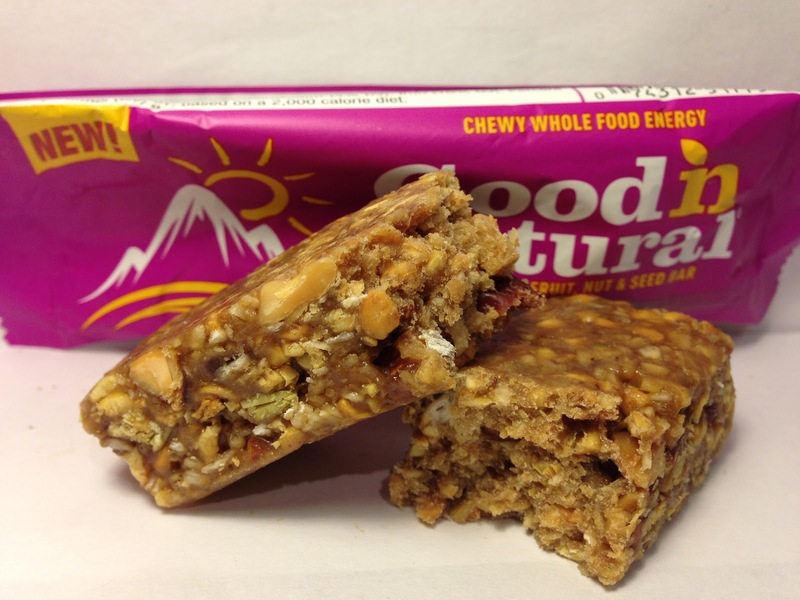 The bar pertinent statistics are that it is 2.0 ounces, 230 calories and has ten grams of protein. It also could be considered edible for just about every person on the planet (except those with nut allergies) as it is gluten free, dairy free, vegan, etc. Sounds pretty healthy, eh? This bar's composition did not differ from the typical Good 'n Natural bar as it had just a gigantic mishmash of fruits, nuts and seeds all combined into one thing. In this bar, that mishmash includes cranberries, raspberries, roasted almonds, almond butter, soy nuts, maple syrup, oats, pumpkin seeds, sesame seeds, pineapple juice and coconut, among many other things. Yep, it's as if they tried to cram half a grocery store into one bar and because of that, this bar is quite dense. All of these ingredients (minus the liquid ones) are plainly visible, so you obviously know you are going to get a bit of this and a bit of that with each bite. While the butters, juices and syrups are not visible, they do make this bar quite sticky to the touch. While this bar may be sticky, it is actually quite dry to chew and I believe that is the by-product of the dried oats and seeds. That dryness kind of makes it a chore to chew through, but I'll admit that I didn't chew through much of this bar as it had an overpowering taste of pineapple and being that I am not at all a fan of pineapple, I did not enjoy that. The pineapple flavor was so overwhelming, in fact, that I couldn't really taste anything else that was in the bar. All that happened with this was that I was chewing through a fairly dry bar that had an occasional pop from an tiny almond, but mostly I was overcome with pineapple. After half the bar, I decided I'd had enough and the remainder went into the trash. Buy It or Fly By It? Not my cup of tea because of the pineapple, so this gets a FLY BY IT rating in my book. Had the pineapple flavor been tamer and the berry flavor been a bit stronger, as the name implied, I may have actually enjoyed this bar. With it's present composition though, this one met an early death in my waste basket. That said, if you are unlike me and really do like pineapples, you may find this bar enjoyable although its dryness may be a turn off for you. That would be for you to decide.